This contemporary electronic protest song wields a unique crossover of indie rock and EDM while emitting lyrical content that can be found in a punk rock history book. Old-school patch work creates synth sounds that have been slowly replaced over years of technological advances. This doesn’t scare Where Are We one bit, as he re-introduces these old technologies in ways that have never been heard before. Fans on either side of the indie spectrum from Tame Impala to Arctic Monkeys can pick up what Brooker is putting down on these inventive tracks. 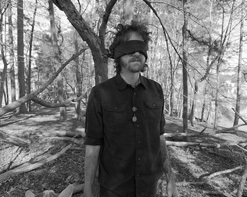 In his own words, “the releases range from hypnotic adventures into electronic dissection, to soft-spoken lilts blooming out of acoustic instruments and reverberated voices.” By recording and mixing all of the material himself, he gains the ultimate freedom to not only choose his own path, but also deviate from that path whenever he so pleases, leaving genre’s irrelevant. His work with Tim Reis began just about 7 years ago. Brooker was suggested as a potential mixing engineer for a film that Reis and friend James Sizemore were working on called The Demons Rook. After pitching a few musical ideas for the score he found himself, not only mixing the entire film, but scoring nearly the entire thing as well. Since then, Where Are We has scored several films for Reis including the 2017 creature-feature Bad Blood: The Movie, which was highly acclaimed online and featured in LA Times. The “Not My President” music video opens up with a faceless, amorphous, cosmos filled character rolling over to shut off his 8 am alarm. As he begins his morning routine, the images change to stock numbers, news, and other things that cloud his brain with worry and dilute the subconscious calmness of sleep. Reflecting the thoughts in his head, his body becomes increasingly volatile, displaying horrid images from the news he’s read about the decisions of the President. The media barrage engulfs his mind and his work life and causes him to get fired for scrolling through news articles on the job. This cracks him and he strips down naked in the street, only to stroll around town in his psychedelic birthday suit. Eventually he finds peace is the woods, starts a fire, burns all of the items in his wallet, and regains his previous cosmic state while meditating next to the lake. We’re thrilled to be teaming up with the wildly imaginative, musically inventive Where Are We to bring you the “Not My President” music video. Please don’t be shy about getting in touch to let us know what we can do on our end to get the “Not My President” video included into your programming and rest assured we’ll have plenty of outstanding Where Are We merch to set up online/on-air contests and giveaways throughout the campaign. Don’t hesitate to let us know what we can do on our end to help you spread the importance of Where Are We! Please contact Andy Gesner and the HIP Video Promo team at (732)-613-1779, email us at info@HIPVideoPromo.com. You can also visit www.WhereAreWe.info for more info on Where Are We.